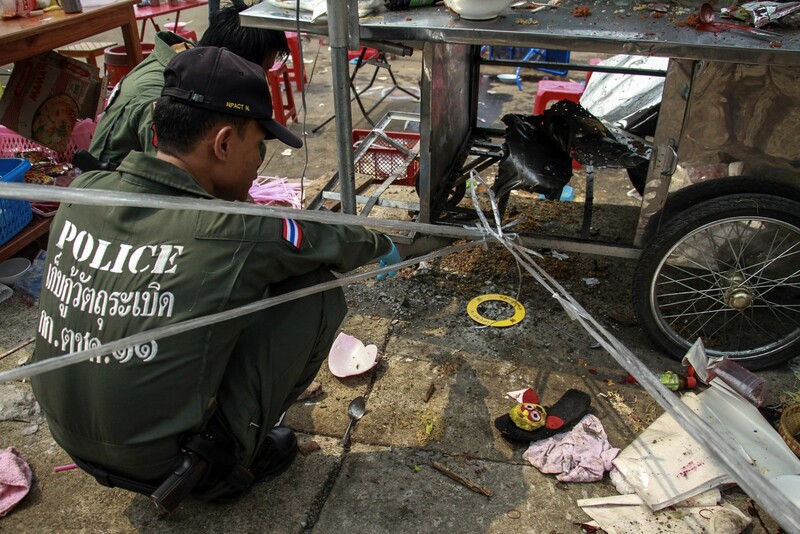 Members of the police bomb squad investigate the site of a grenade attack on a roof of the National Anti-Corruption Commission office in Nonthaburi province. 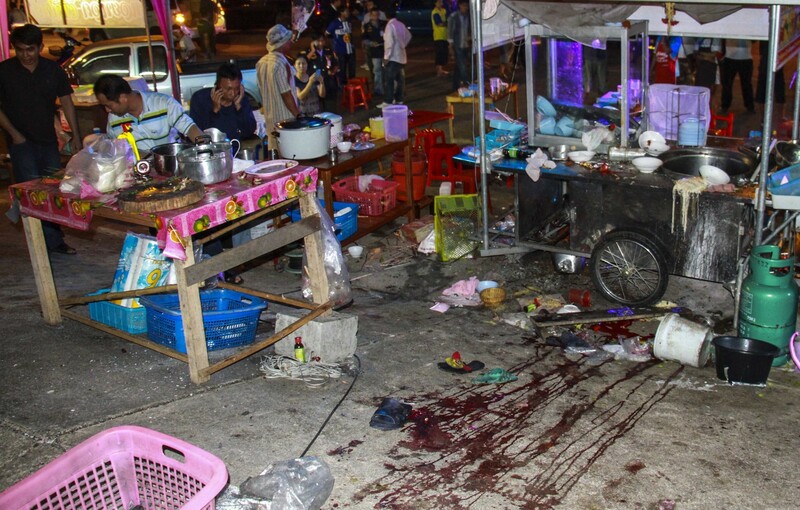 THAILAND - Two M79 grenades exploded at the National Anti-Corruption Commission compound, and another on the Government Lottery Office next door, late on Monday night. They caused property damage but no casualties. Of the two rounds targeting the NACC compound, one hit the deck above the ground floor and the other the roof of another building. The third grenade hit a building in the GLO compound and exploded. 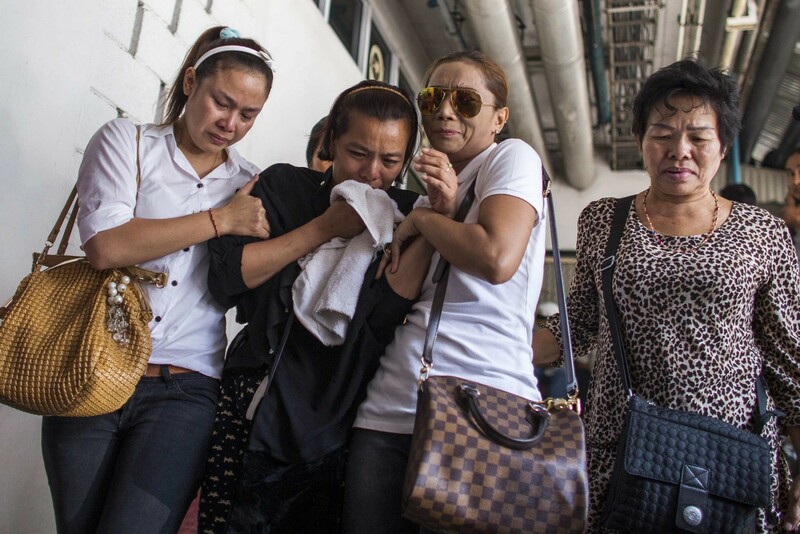 An initial crime-scene investigation estimated the launch site was possibly 300 metres away, and located near Soi Nonthaburi 48 of Nonthaburi 1 Road, east of the NACC compound. In another incident, two men on a motorcycle fired five shots at the Bangkok-based Davis Hotel owned by flamboyant politician Chuwit Kamolvisit on Tuesday morning. 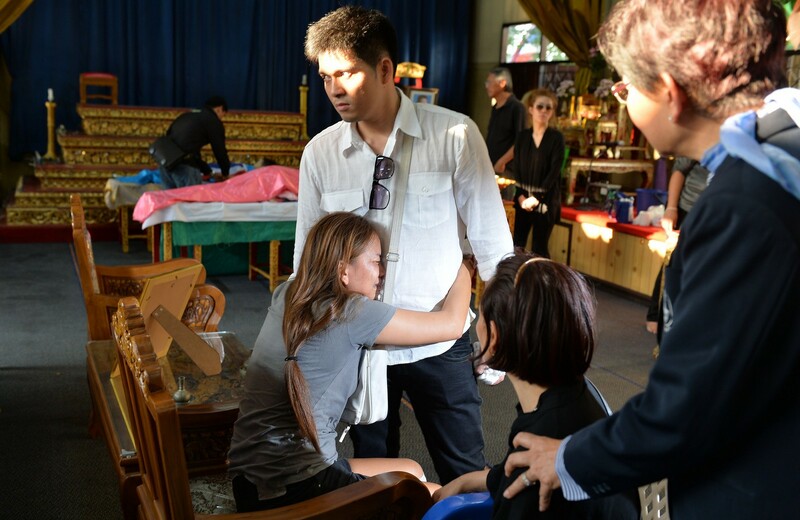 Chuwit said it was an actual shooting - not his own set-up. 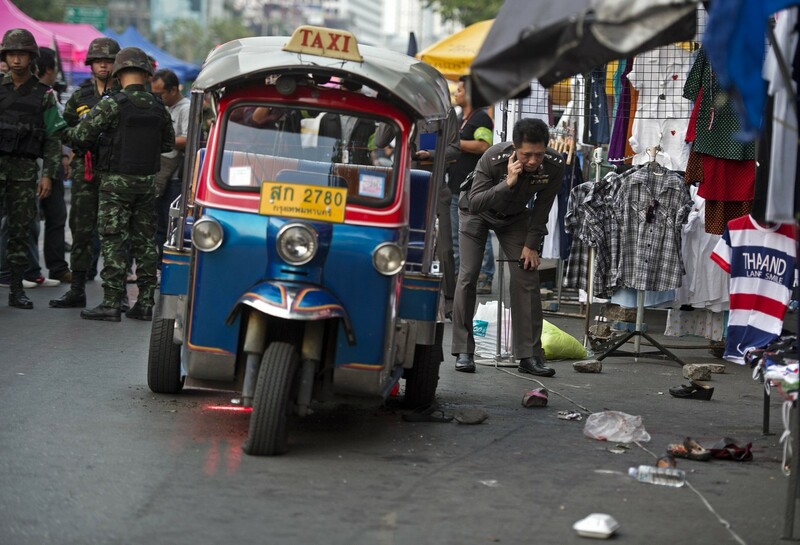 Surveillance camera footage showed two men riding past on a motorcycle and firing at the hotel, located in Sukhumvit Soi 24. Meanwhile, police are obtaining an arrest warrant for a man identified as Sumeth Trakoolwunnoo, reportedly a senior guard working for the anti-government People's Democratic Reform Committee. Sumeth allegedly was implicated by a suspect known as the "popcorn gunman", who was recently arrested, police said. 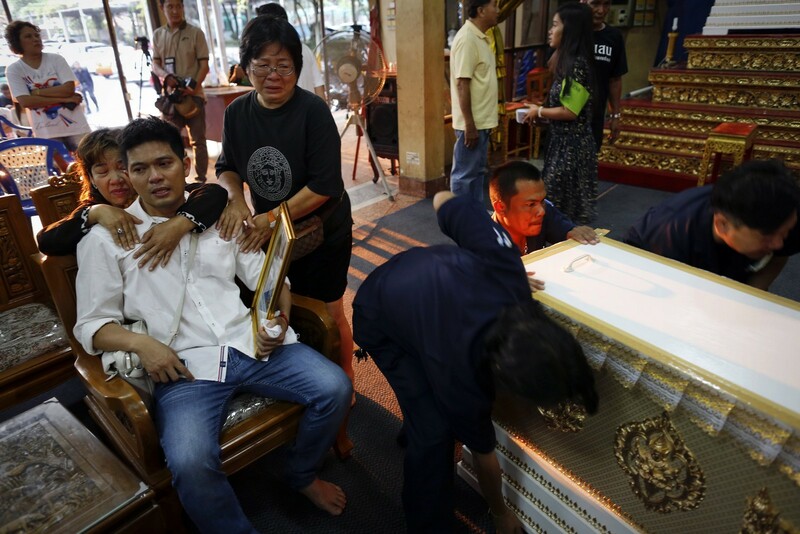 They quoted Wiwat Yordprasit as alleging that Sumeth sheltered him and was involved in the shooting at Lak Si intersection in February. Police spokesman Pol Maj Gen Piya Uthayo accused Sumeth of being one of 22 suspects under scrutiny by the police for involvement in the shooting. 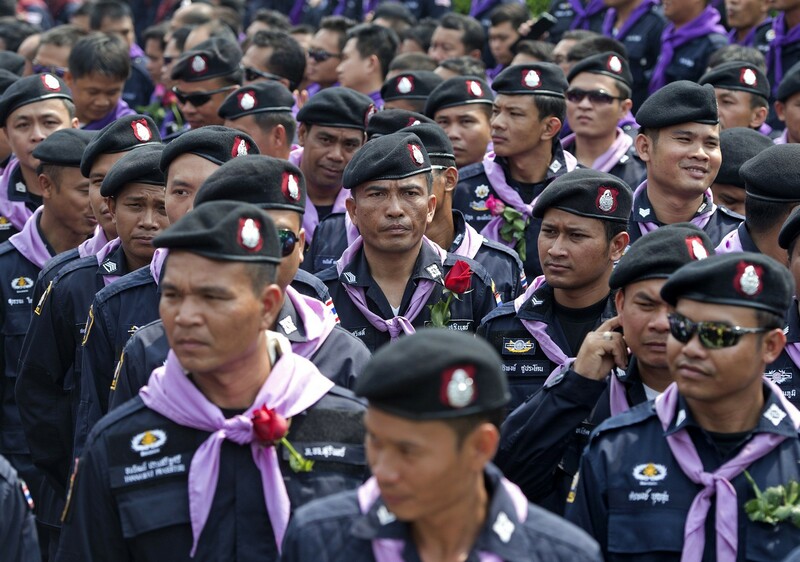 Sumeth is however not among the four PDRC guards wanted on arrest warrants already approved by the court. Police yesterday arrested four pro-government red shirts, one a woman, for assaulting a monk - an incident widely distributed in images online. A large group of people is seen clearly attacking the monk, but police arrested only four people. 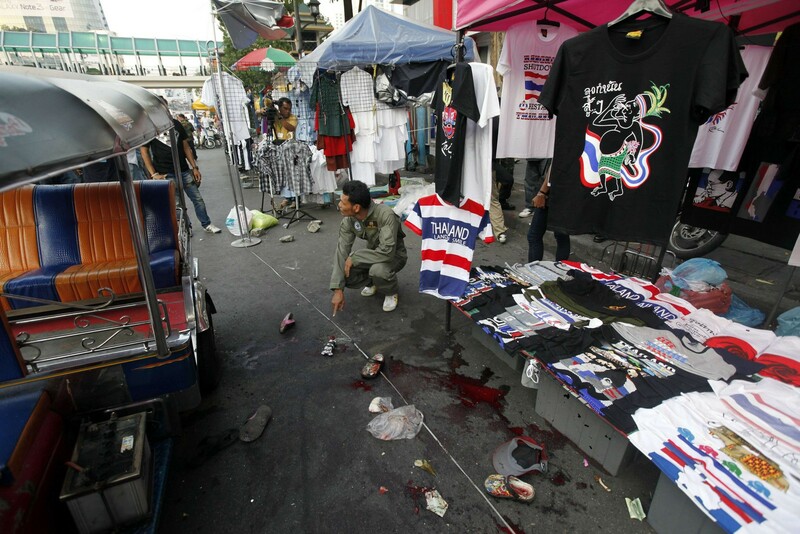 A bomb exploded in a busy shopping district on Sunday, wounding at least 22 people near an anti-government protest site. 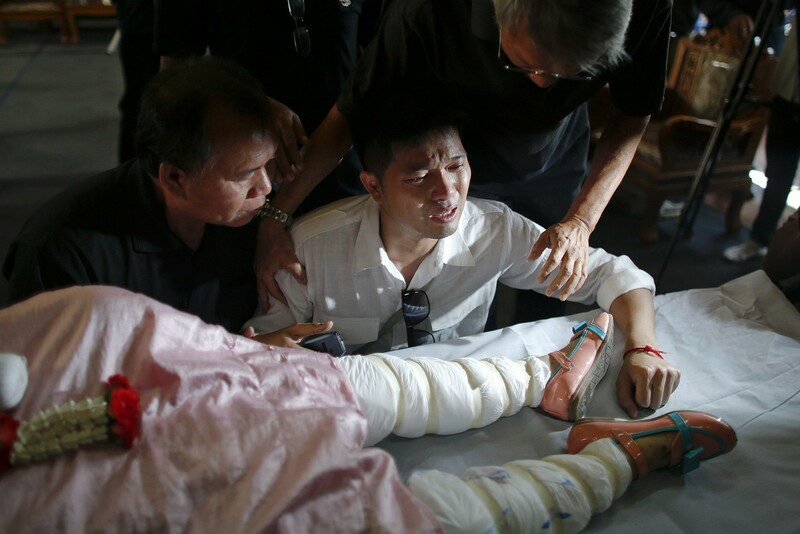 A four-year-old boy, his six-year-old siste and a 59-year-old woman were killed in the blast. Some others children are still in critical condition. A nine-year-old boy was in intensive care in hospital with severe head injuries. 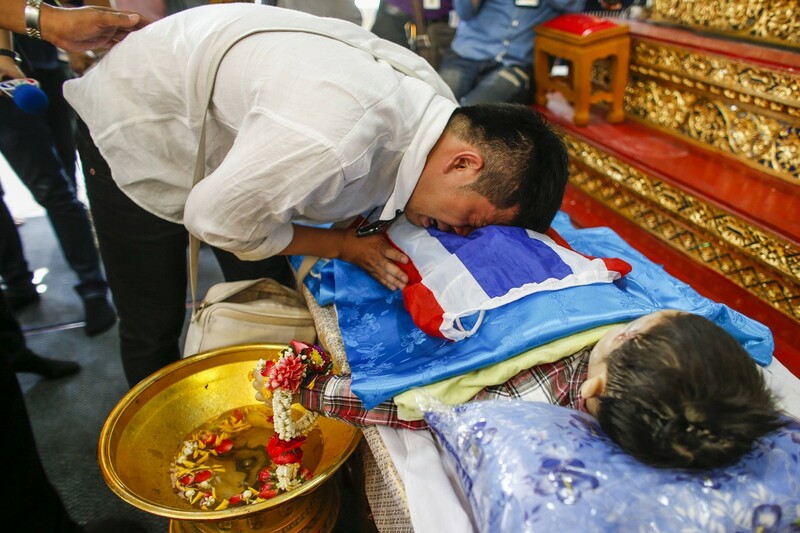 Thayakorn Yosubon, the father of a pair of siblings killed in a bomb blast near an anti-government protest site on Sunday, mourns next to their bodies being prepared for a funeral at a Buddhist temple in Bangkok February 24, 2014. 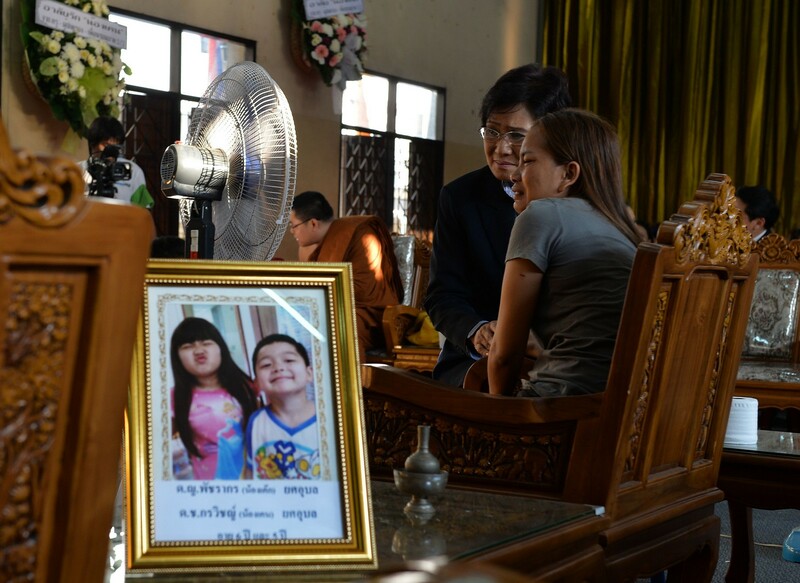 The six-year-old sister of a boy killed in a bomb blast in the Thai capital died on Monday, doctors said, taking the death toll to three from the latest incident in a conflict that has burst into episodic violence and shows no sign of ending. 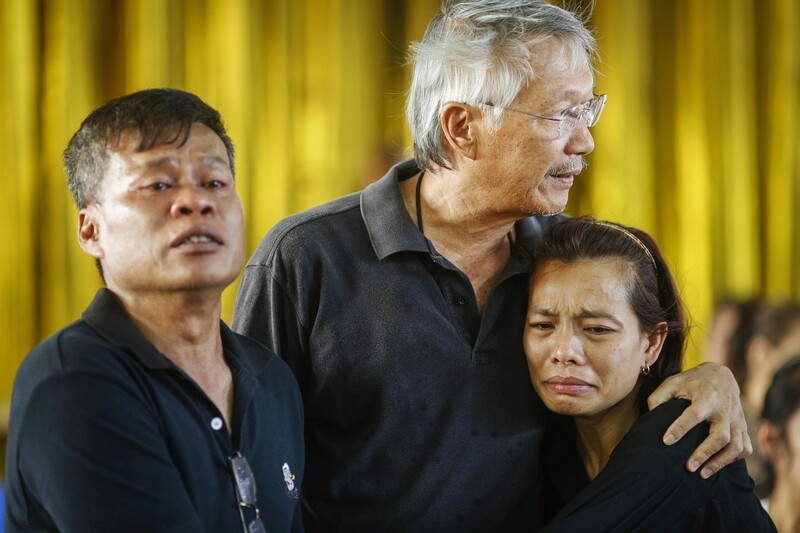 The father who lost his children to Sunday's grenade attack says he is engulfed in pain, but feels no anger against the attackers who were apparently targeting the anti-government rally site. 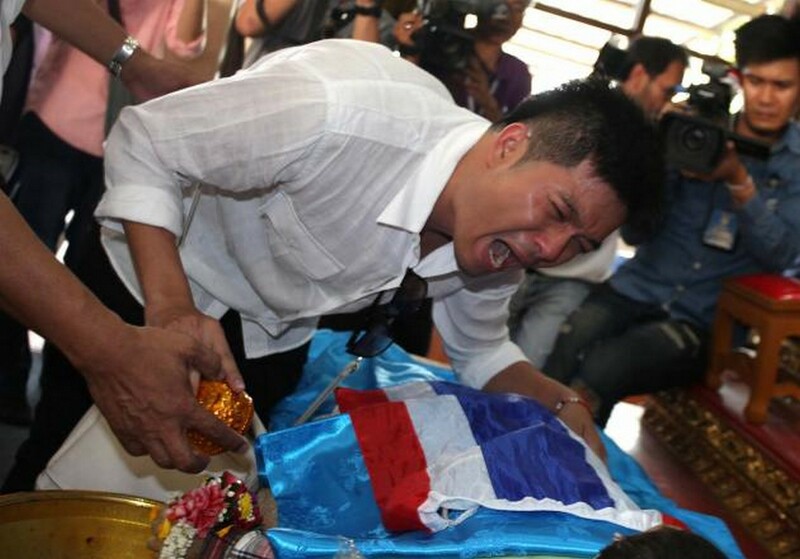 "I am suffering the deepest pain, but have decided to forgive," Thayakorn Yos-ubol said tearfully. 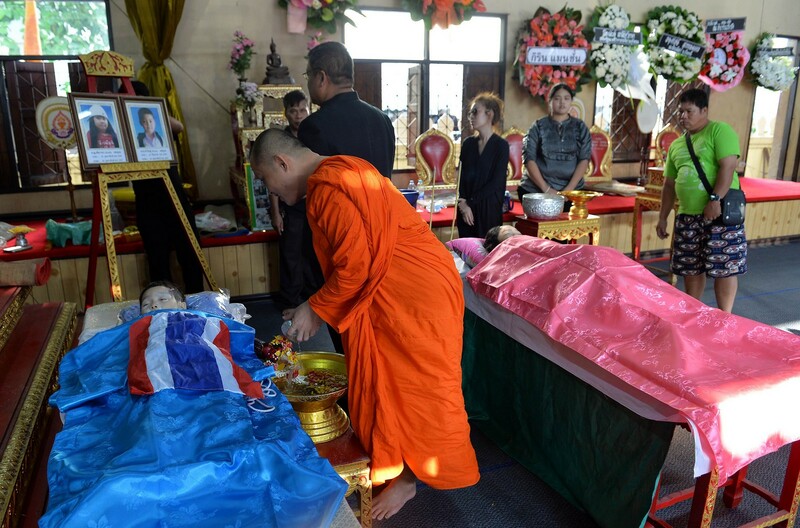 They had simply gone shopping with their aunt and cousin when they were hit by a grenade that landed in front of Big C shopping mall on Rajdamri Road on Sunday afternoon. "I can't cope with what has happened. My children were so pure and innocent. 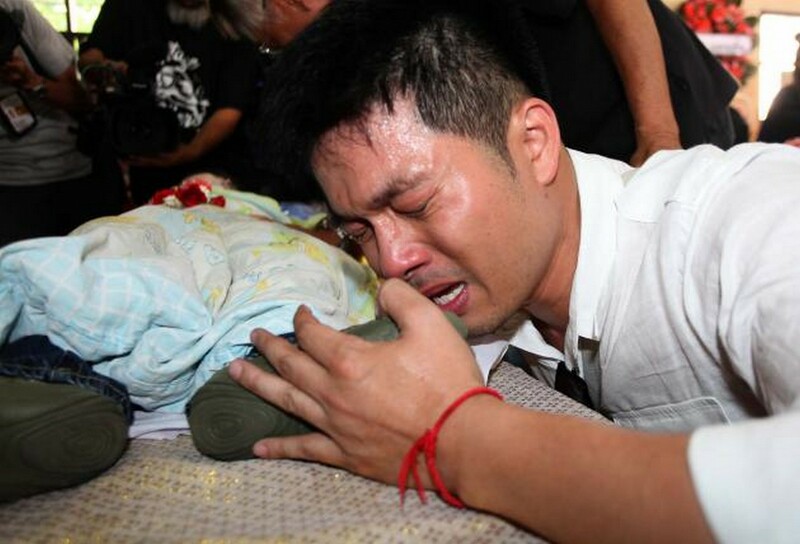 I really don't know how long it will take for this wound in my heart to heal," the devastated father said. 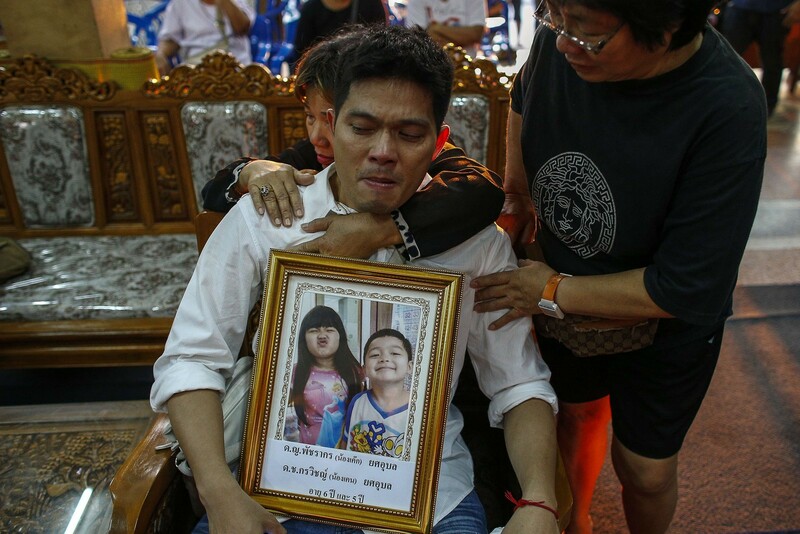 Thayakorn went on to say that he had a simple dream for his children - he just wanted them to grow up and become good members of society. 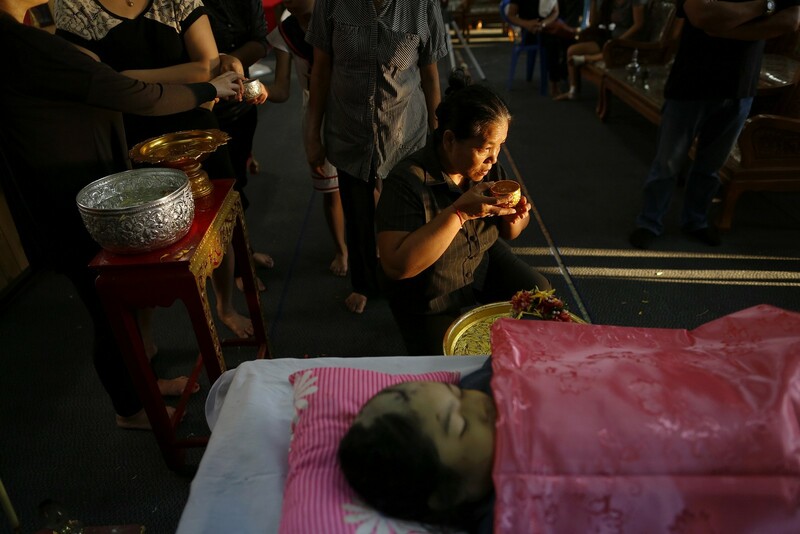 Noppawan Chairat (2nd R), the mother of a pair of siblings killed in Sunday's bomb blast near an anti-government protest site, mourns during their funeral at Buddhist temple in Bangkok February 24, 2014. People pay respect next to the bodies of a pair of siblings killed in a bomb blast near an anti-government protest site on Sunday, during their funeral ceremony at a Buddhist temple in Bangkok February 24, 2014. 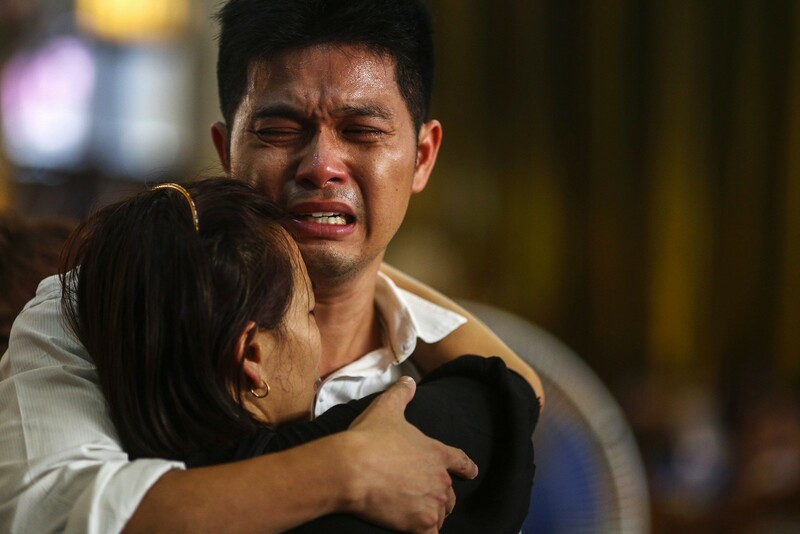 Relatives of a pair of siblings killed in a bomb blast near an anti-government protest site on Sunday, mourn as family members arrive to collect bodies from a hospital in Bangkok February 24, 2014. "But now my dream is dead," he said as he hugged his wife while waiting to pick up their children's bodies. Both children were pronounced dead at Ramathibodhi Hospital - the place they were born. 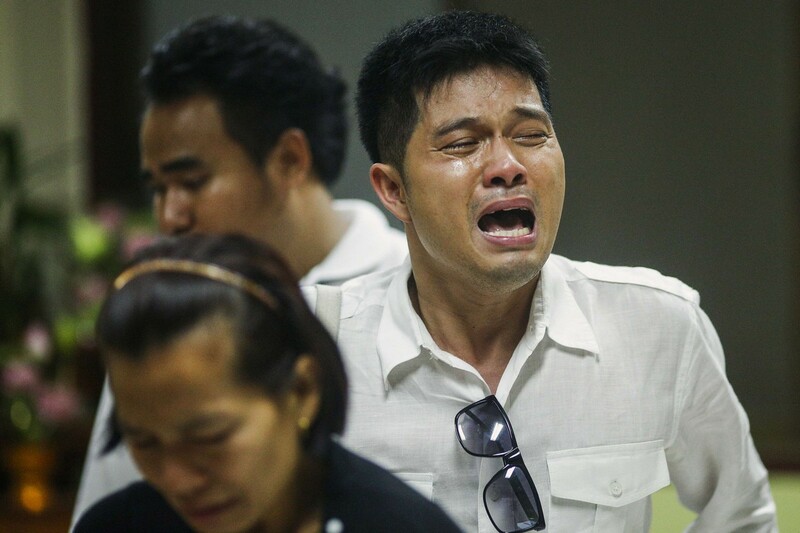 "This is a tragedy," the hospital's director Dr Surasak Leela-udomlipi told the press. Korawich passed away on Sunday evening, while his sister succumbed to injuries on Monday morning. 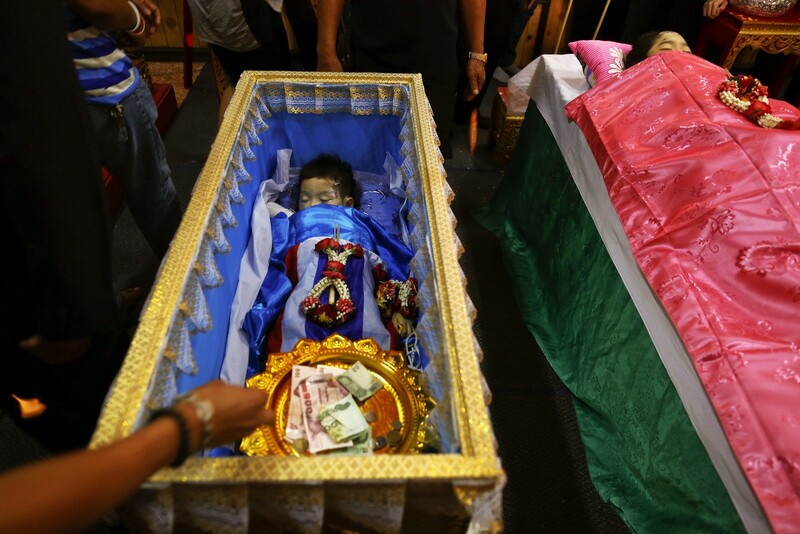 Their nine-year-old cousin, Yothin Cha-aemram, is under intensive care at the same hospital. 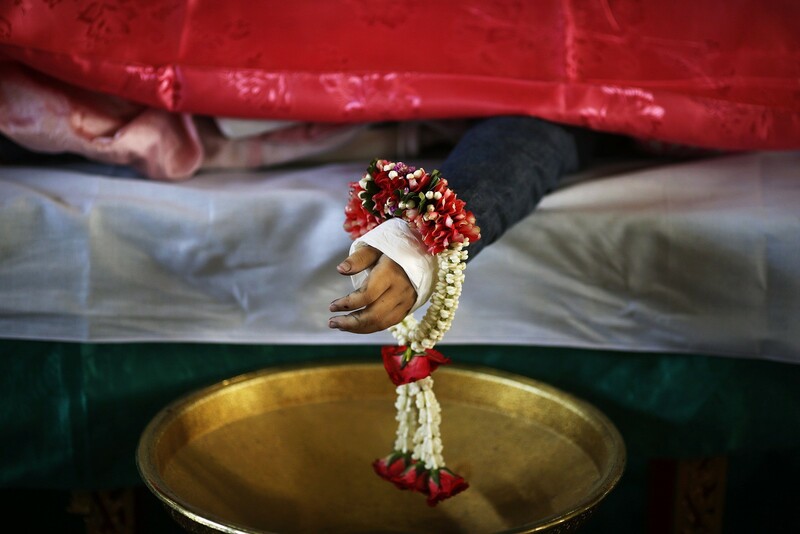 A relative pours water over the hand of a child killed in a bomb blast near an anti-government protest site on Sunday, during a funeral at a Buddhist temple in Bangkok February 24, 2014. 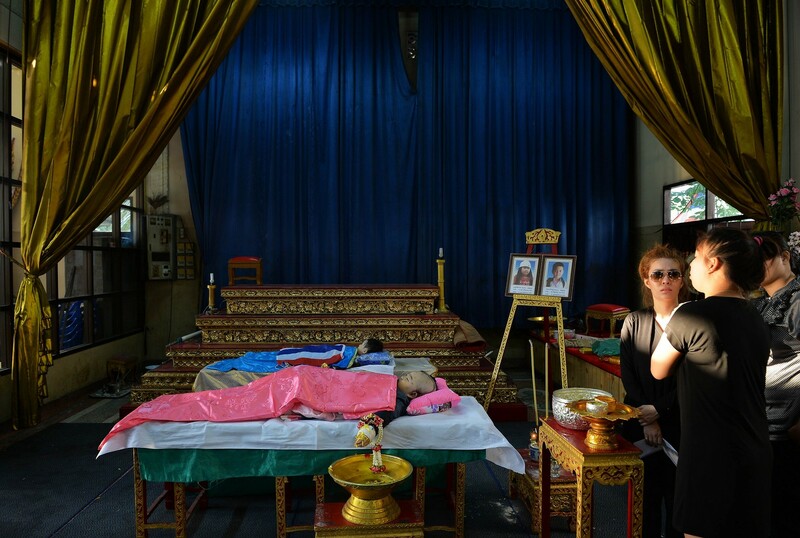 Relatives of a pair of siblings killed in a bomb blast near an anti-government protest site on Sunday, mourn during a funeral at a Buddhist temple in Bangkok February 24, 2014. 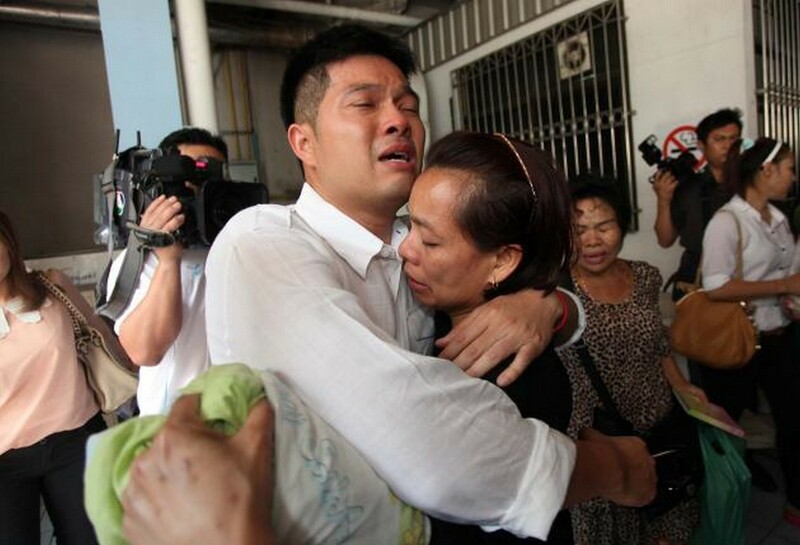 Yothin's mother Nareerat Chairat wished she had been hit instead of the children. "Better me than my nephew, niece and son," the distraught mother, who was in a wheelchair, said. 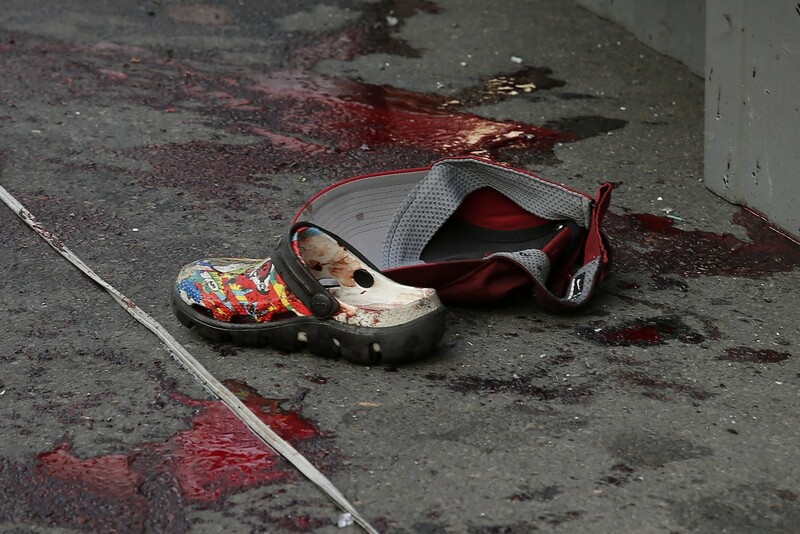 She also sustained injuries from the blast, but they are not very serious. 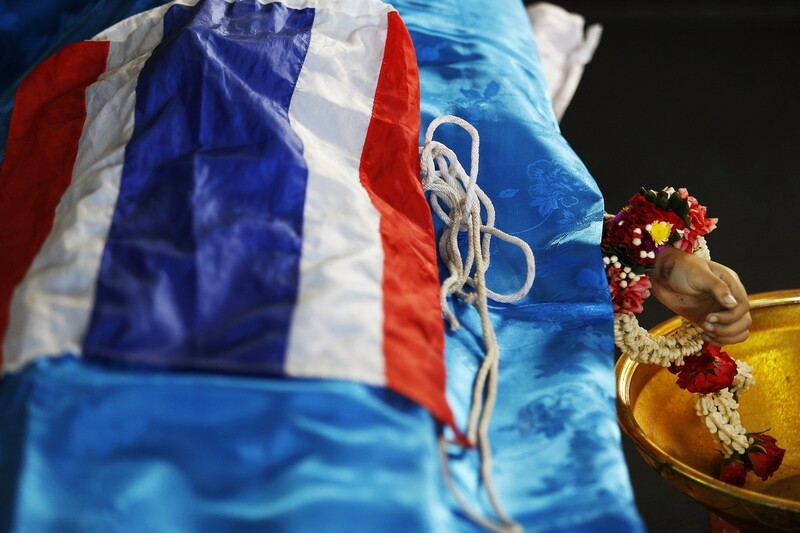 Nareerat said she and the children were about to hail a tuk-tuk to head back to Thayakorn's home when the grenade suddenly landed in their vicinity and exploded. "I wish it was just a bad dream," she lamented. 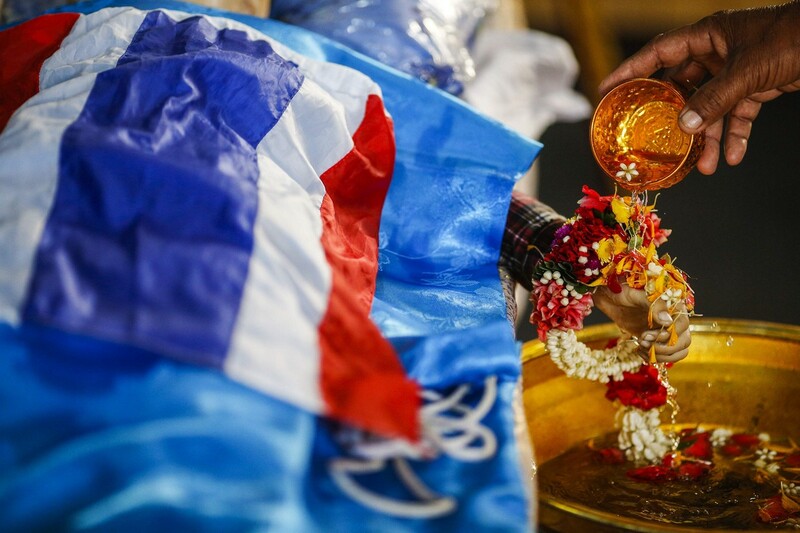 Thayakorn, however, said he hoped all sides would learn from this and bring an end to the chaos. 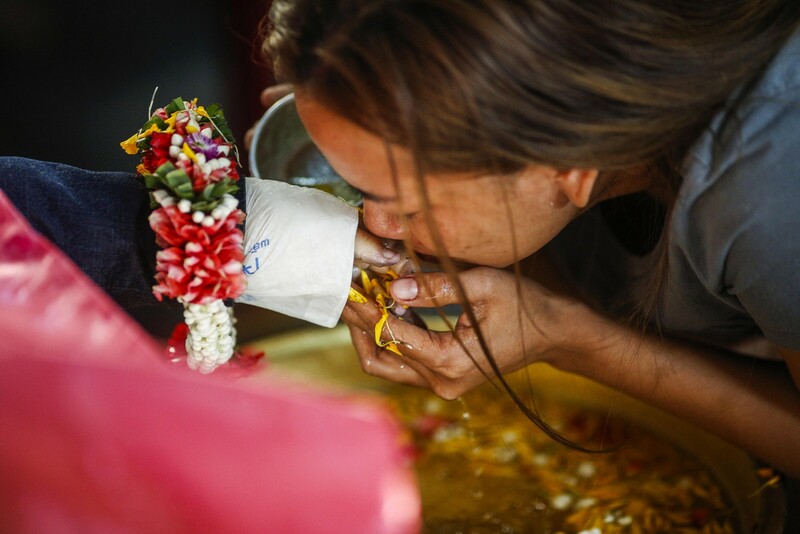 He said his focus was on holding his kids' funeral rites, which will be held at Phrom-wongsaram Temple (Wat Luang Phor Nane). 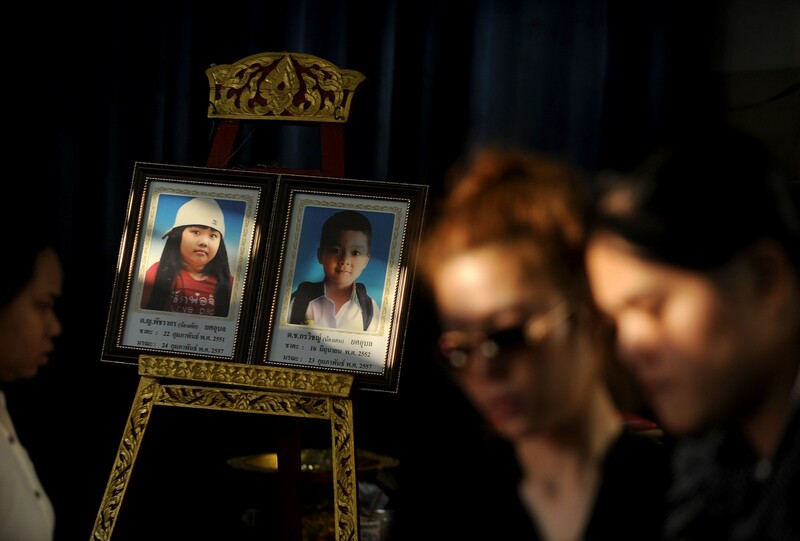 The parents of two children who were killed in a bomb blast near an anti-government protest site on Sunday mourn as family members arrive to collect bodies from a hospital in Bangkok February 24, 2014. 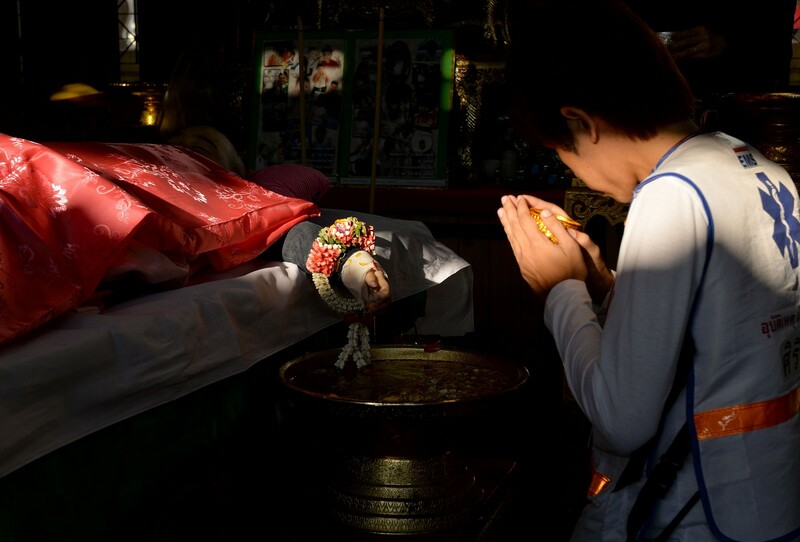 A mourner pays respect to 6-year-old Patcharakorn Yosubon, the victim of a bomb blast, during the last rites being performed at a Buddhist Temple in Bangkok on February 24, 2014. 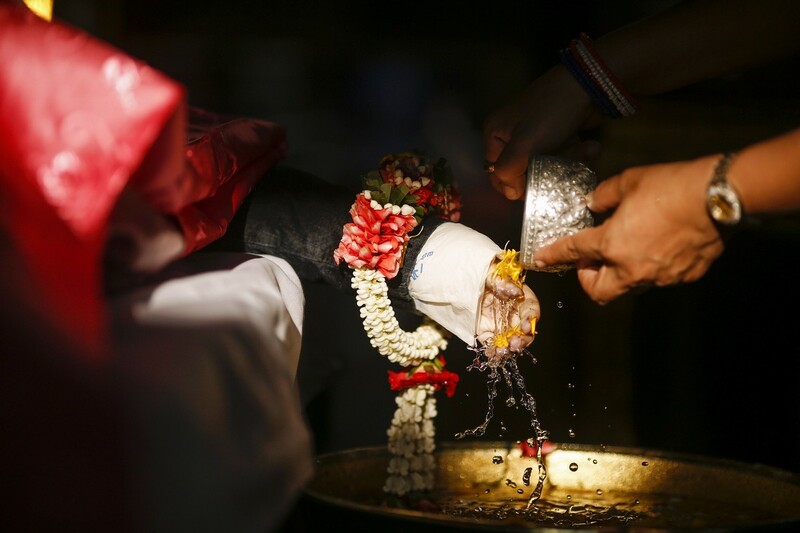 Mourners pour water on the hands of the bodies of 6-year-old Patcharakorn Yosubon (R) and her brother, 4-year-old Koravitch Yosubonis (L), victims of Sunday's bomb blast during the last rites performed at a Buddhist Temple in Bangkok on February 24, 2014. Family members of blast victims six-year-old Patcharakorn Yosubon and her brother four-year-old Koravitch Yosubon cry during last rites, at a Buddhist temple in Bangkok on February 24, 2014. 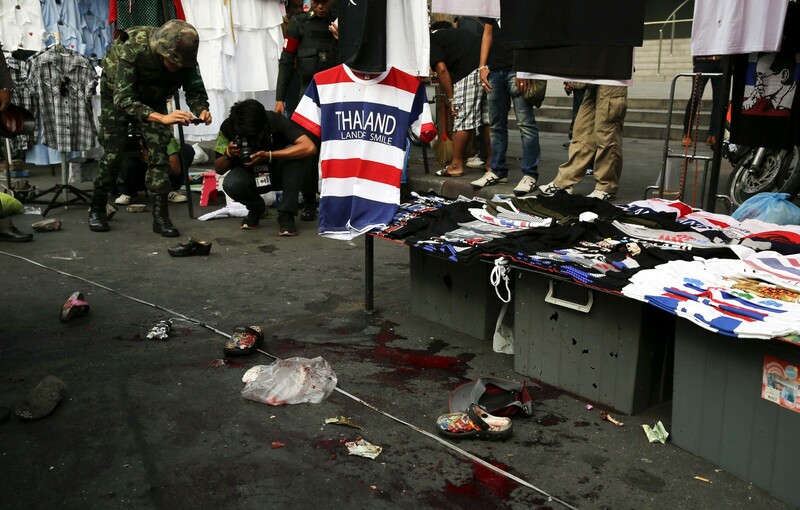 Blood stains are seen at the scene where an explosion took place near the anti-government protest site at Khao Saming district, in Trat province February 22, 2014. 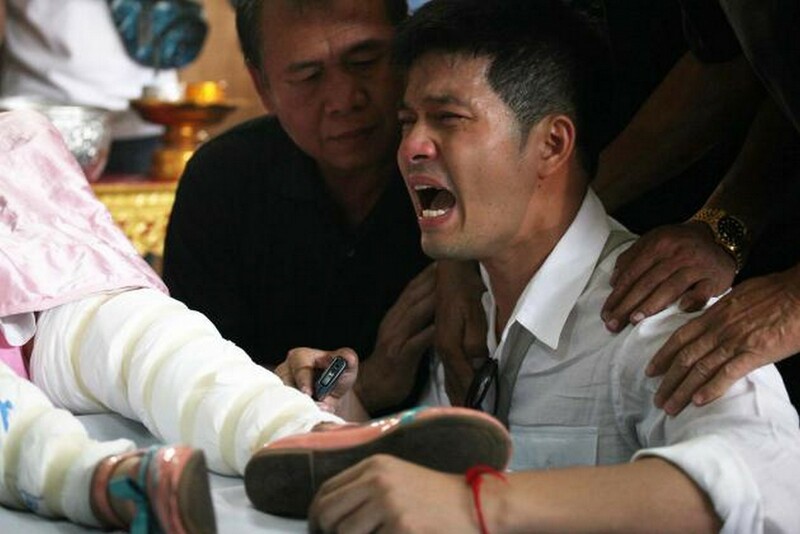 Supporters of Thai Prime Minister Yingluck Shinawatra promised on Sunday to get tough with anti-government protesters paralysing parts of Bangkok, raising tension in a protracted crisis hours after a deadly attack on a protest rally. 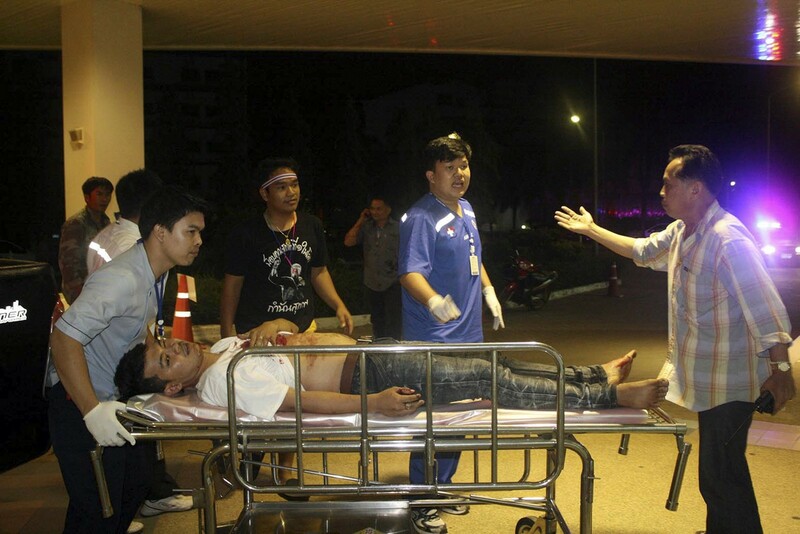 An injured man is wheeled by rescue workers at a hospital in Khao Saming district, Trat province February 22, 2014. 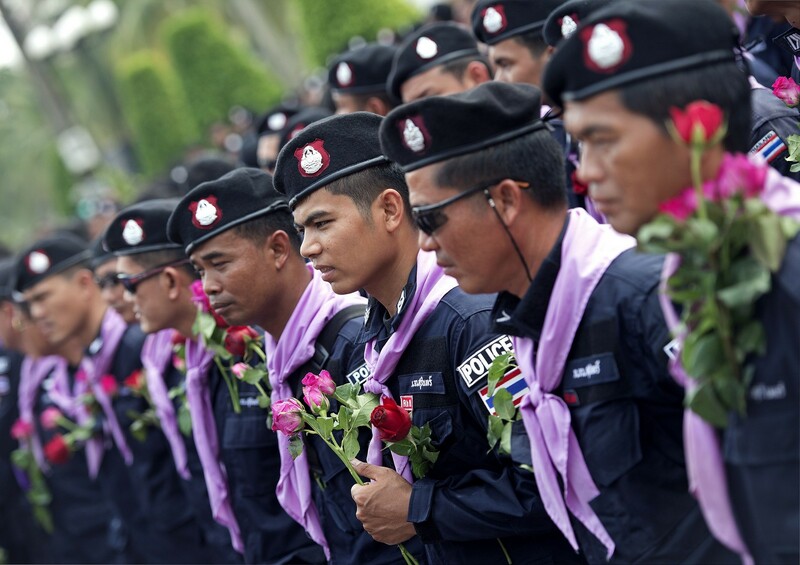 Thai police officers inspect the site of an explosion scene during an anti-government protest at Khao Saming district, Trat province February 23, 2014. 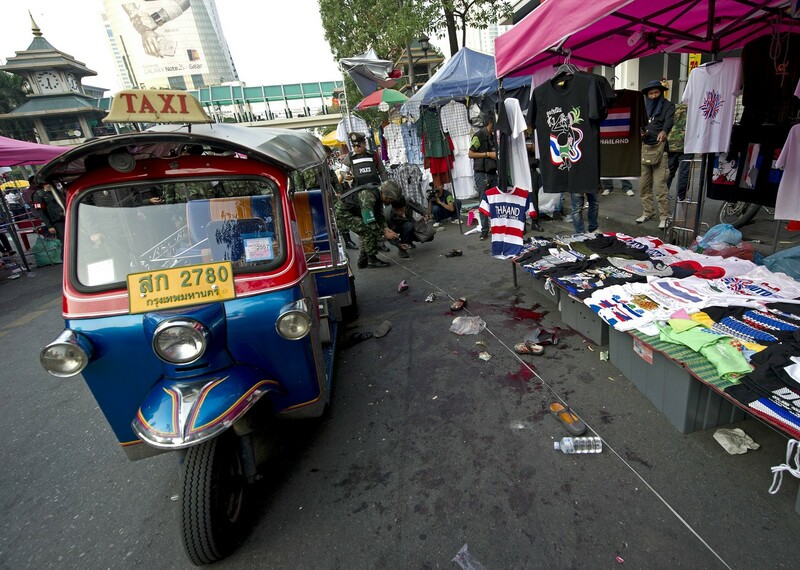 Thai police and soldiers inspect the site of bomb blast near an anti-government rally in Bangkok on Fenruary 23, 2014. 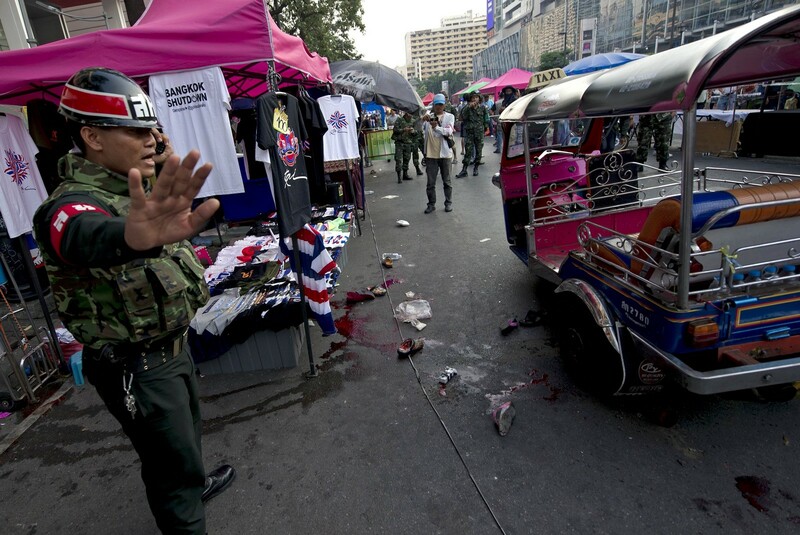 At least sixteen people were injured in a blast in a popular Bangkok shopping district on Fenruary 23, health officials said, further amplifying tensions a day after gunmen opened fire on an anti-government rally in eastern Thailand, killing a five-year-old girl. 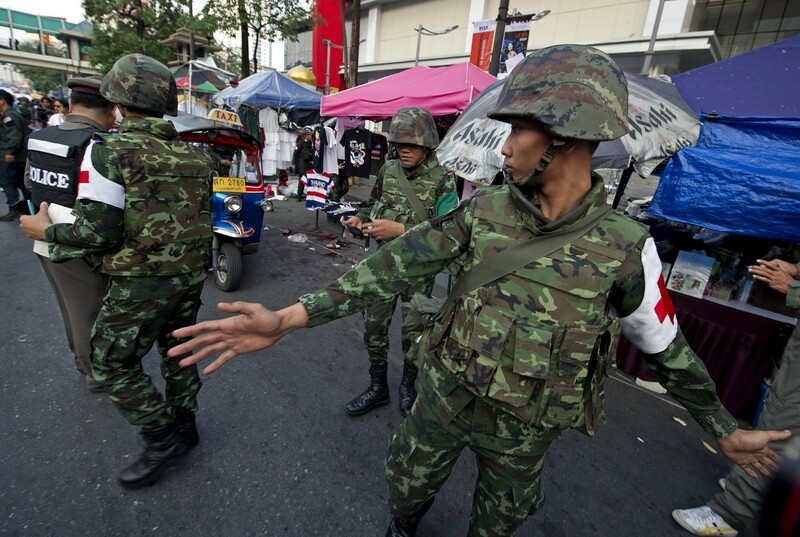 A Thai soldier gestures at the site of bomb blast near an anti-government rally in Bangkok on Fenruary 23, 2014. 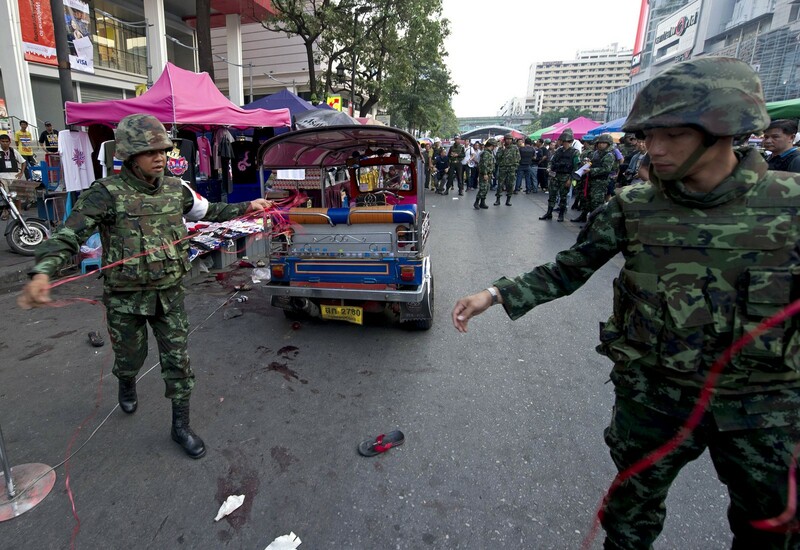 Thai soldiers inspect the site of bomb blast near an anti-government rally in Bangkok on Fenruary 23, 2014. 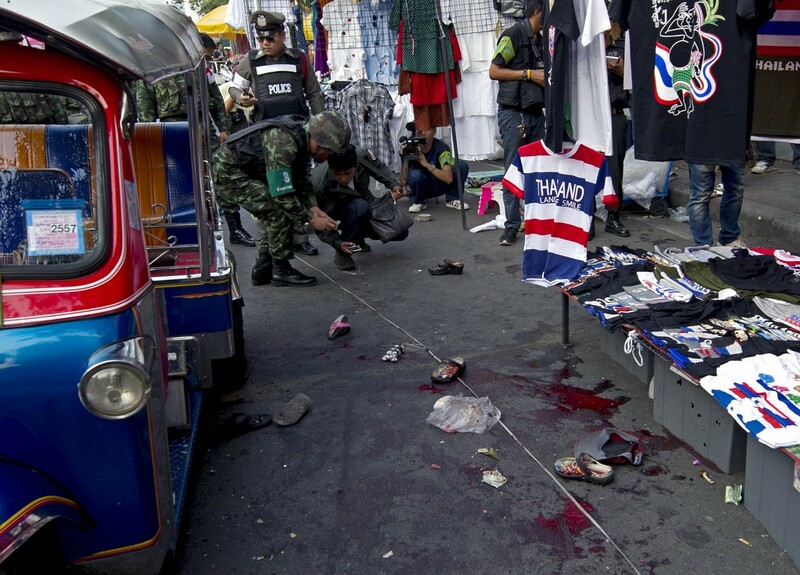 A woman and a child were killed in a grenade attack Sunday in a main Bangkok shopping district, drawing the Thai prime minister's denunciation of "terrorist acts" as fears over violence mount after nearly four months of political crisis. 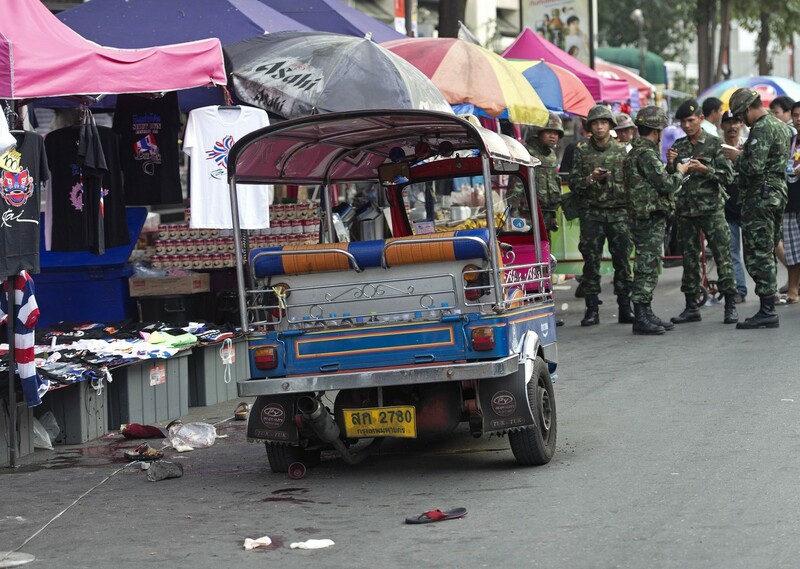 Thai soldiers inspect the site of a bomb blast near an anti-government rally in Bangkok on Fenruary 23, 2014. 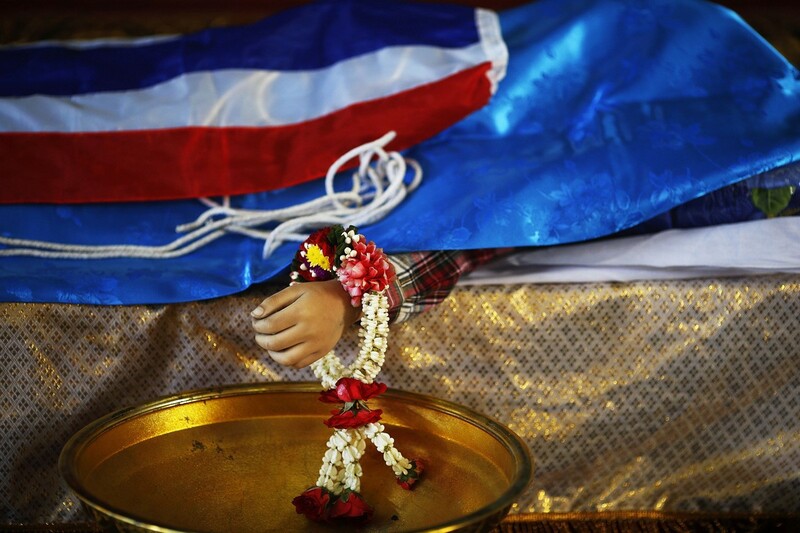 The Sunday afternoon attack came a day after a young girl died and dozens were hurt in a drive-by shooting at a protest rally in eastern Thailand. 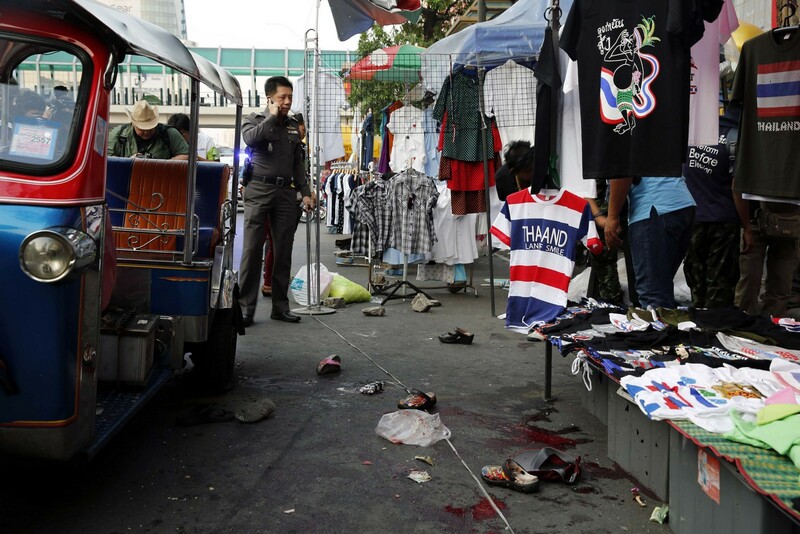 The explosion occurred during an anti-government rally in an area popular with tourists for its street stalls, hotels and proximity to one of the biggest shopping malls in Thailand's capital. 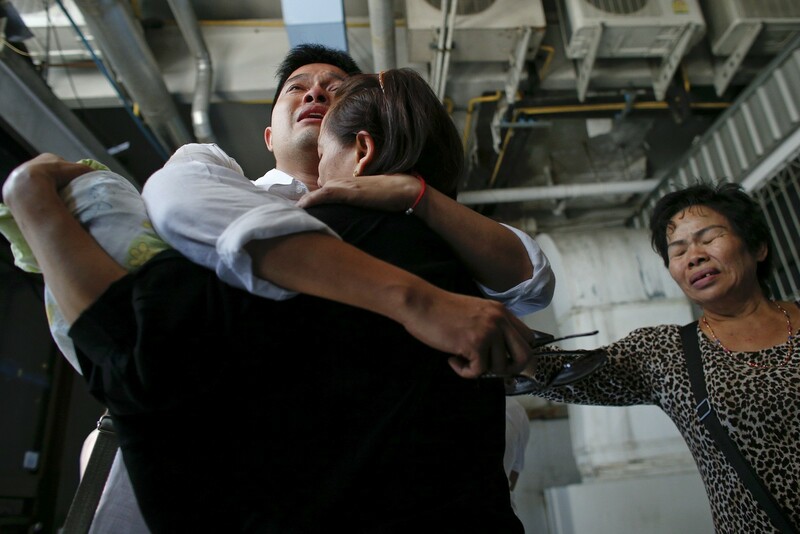 "A 40-year-old woman and a 12-year-old boy died and 22 people were injured," the Erawan emergency centre said in an update on its website. Two children were among the injured. 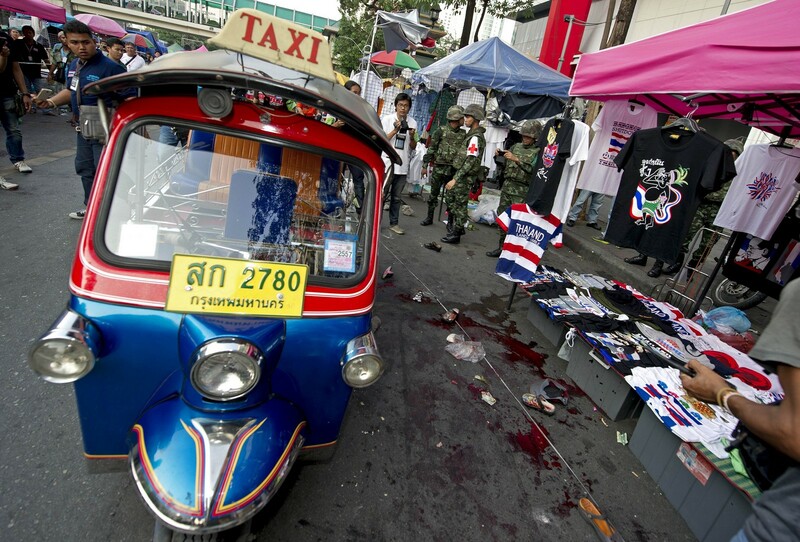 A damaged tuk-tuk was left abandoned on the blood-splattered road as soldiers and police sealed off the area. 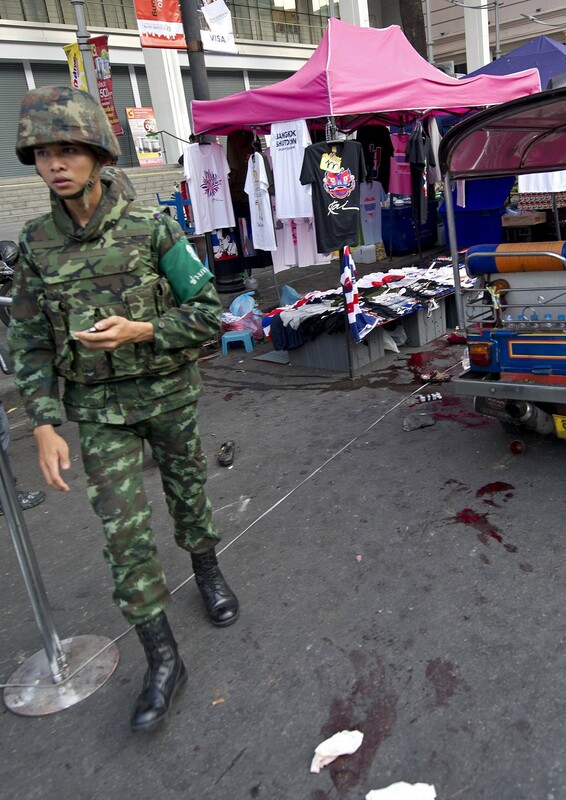 Thai soldiers stand guard at the site of bomb blast near an anti-government rally in Bangkok on Fenruary 23, 2014. 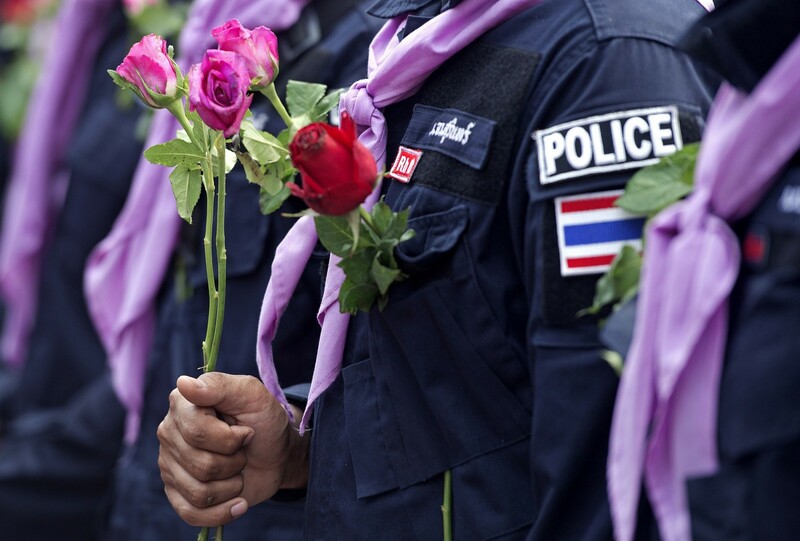 Thai police hold roses received from their supporters at the Police Club in Bangkok on February 23, 2014. 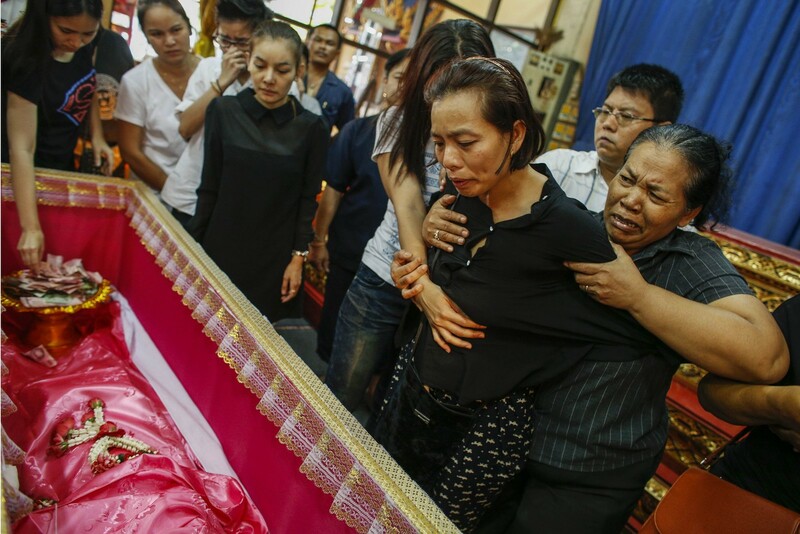 A Thai policeman was shot dead as security forces clashed with opposition protesters during an operation to reclaim besieged government buildings in Bangkok last week. 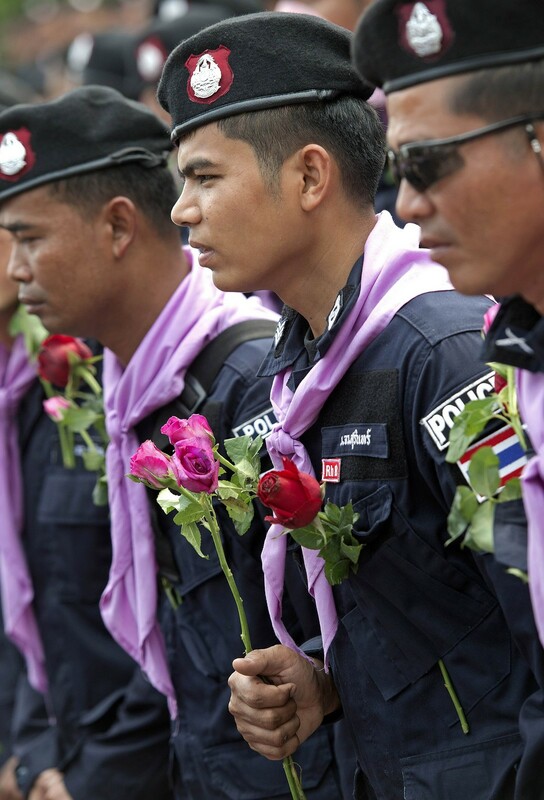 Thai police hold roses received from their supporters at the Police Club in Bangkok on February 23, 2014. 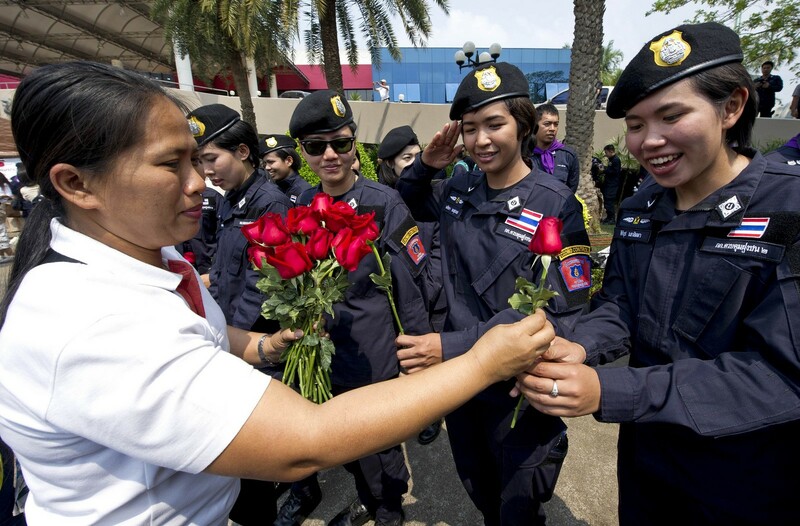 Thai police wear roses received from their supporters at the Police Club in Bangkok on February 23, 2014. 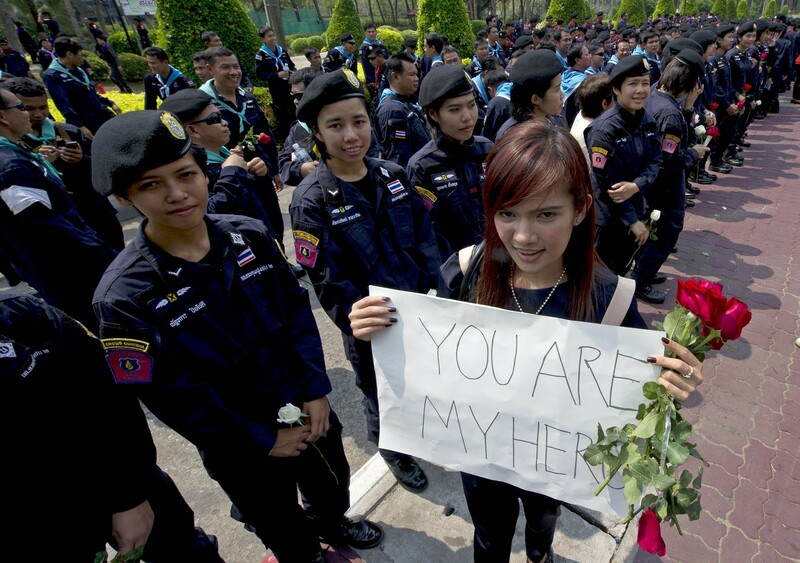 A Thai woman holds a placard to support Thai police at the Police Club in Bangkok on February 23, 2014. 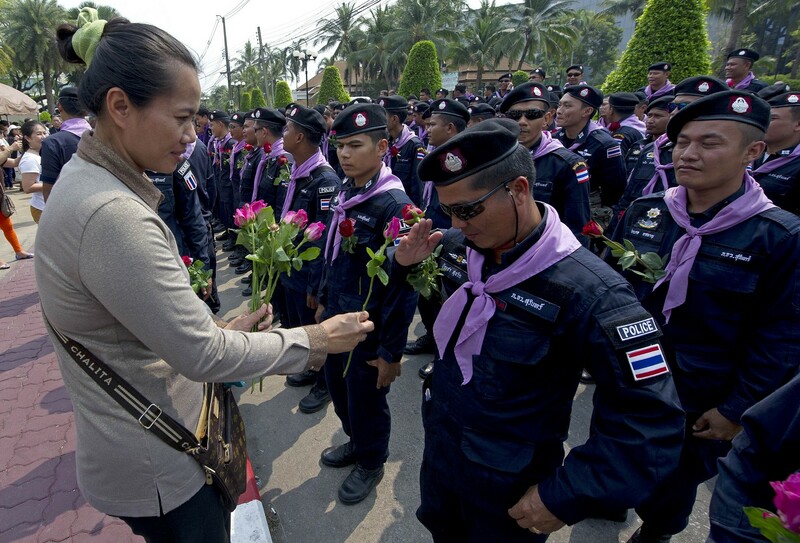 A Thai woman (L) hands out roses to support Thai police at the Police Club in Bangkok on February 23, 2014. 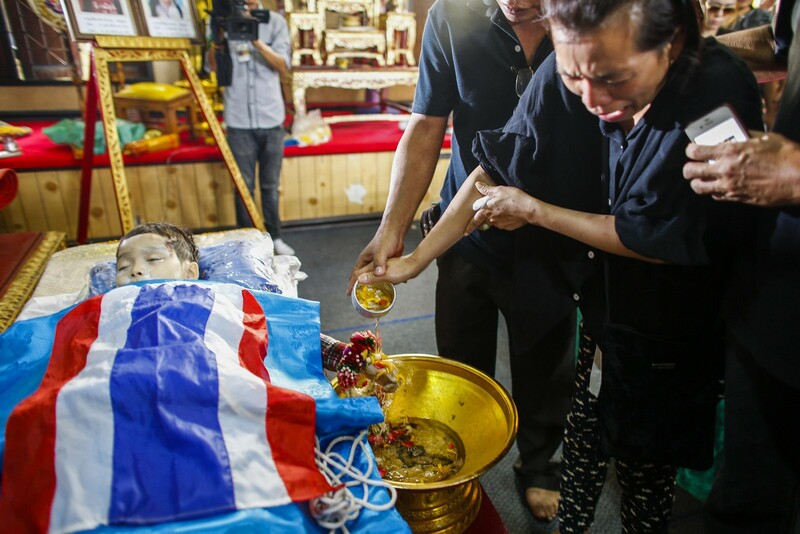 The body of one of the siblings killed in a bomb blast near an anti-government protest site on Sunday is prepared for a funeral at a Buddhist temple in Bangkok February 24, 2014. 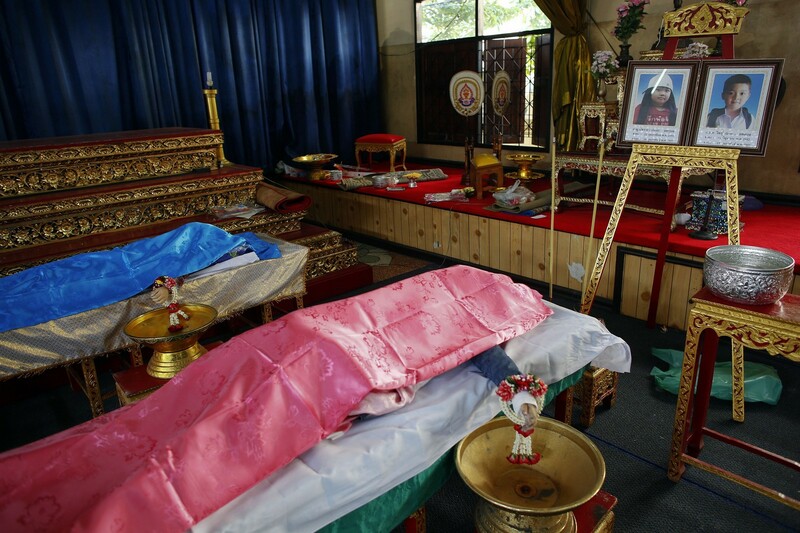 The bodies of a pair of siblings killed in a bomb blast near an anti-government protest site on Sunday are prepared for a funeral at a Buddhist temple in Bangkok February 24, 2014.